1. This packet contains enough market slips for 8 students. To accommodate more, print multiples and distribute. I recommend printing one role (comprador/vendedor) on paper with one color and the other role on another color of paper so students can visually see who they should be working with. 2. I recommend talking to students about the traditions of open air markets. You can easily show them some pictures from famous markets. Here’s an article on open-air markets to help you prepare for the discussion, and here is an article on the top open-air markets around the world. 3. 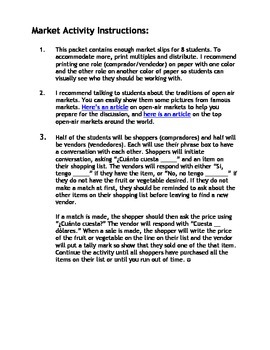 Half of the students will be shoppers (compradores) and half will be vendors (vendedores). Each will use their phrase box to have a conversation with each other. 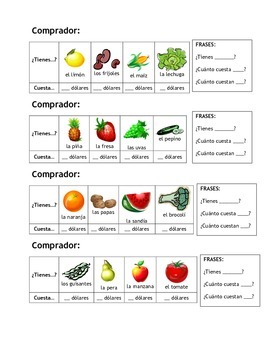 Shoppers will initiate conversation, asking “¿Cuánto cuesta _____” and a fruit or vegetable on their shopping list. 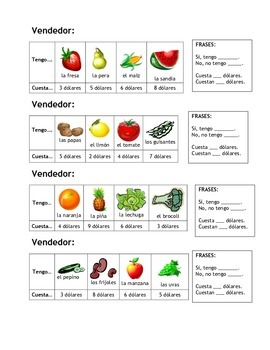 The vendors will respond with either “Si, tengo _____” if they have the item, or “No, no tengo _______” if they do not have the fruit or vegetable desired. If they do not make a match at first, they should be reminded to ask about the other items on their shopping list before leaving to find a new vendor. My students love this activity! They even make their own versions of it and play at home.